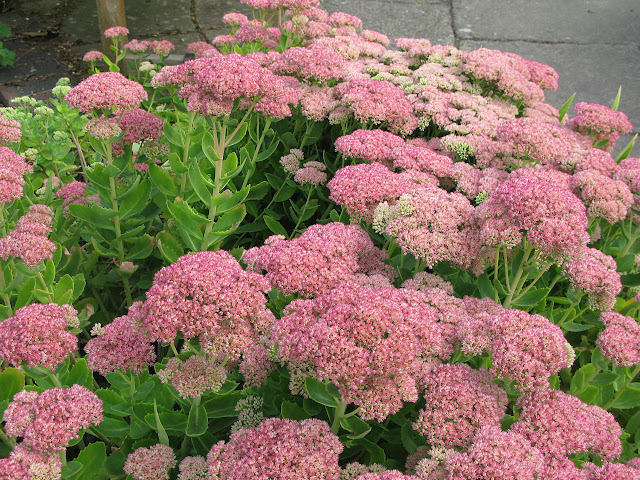 Now re-classified as the unpronounceable Hylotelephium spectabile 'Herbstfreude', Sedum spectabile 'Autumn Joy' is a clump-forming herbaceous perennial, the true species of which is native to China and Korea. It is a popular garden plant not due to its ability to cope with drought, but for its nectar rich blooms which provide a valuable late summer source of food for butterflies and other insects. It is even recommended by Butterfly Conservation and the Royal Horticultural Society no less for attracting butterflies into the garden. Under normal conditions you can expect Sedum spectabile 'Autumn Joy' to achieve an approximate height and spread of between 0.1-0.5 metres. Once near their maximum height, the stems can be prone to collapsing like a ring of dominoes. However if this habit offends you then consider cutting back one third of the new growth in May. This will result in slightly smaller (but more numerous) flowers and less leggy growth. It has broadly ovate white-green succulent leaves that can appear in twos or threes at each node. The pink flower heads appear from September to October in flat cymes which can be up to 15 cm across. 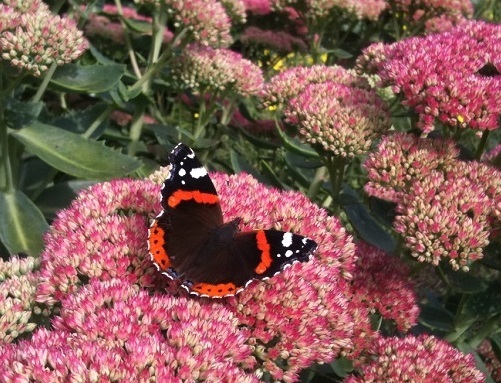 Grow Sedum spectabile 'Autumn Joy' in any moderately fertile, well-drained, neutral to slightly alkaline soil. Just make sure that it is positioned in full sun. The best time of year to plant is during suitable weather between October and April. Cut back after flowering to maintain shape or leave seedheads overwinter and remove the spent stems in the spring.